Being known as someone who enjoys multiple interpretations of Sherlock Holmes and John Watson has its rewards. 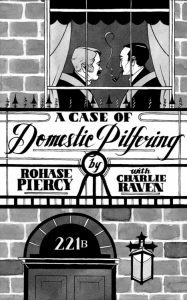 I was contacted out of the blue a few months ago with an offer of a review copy of A Case of Domestic Pilfering, a story originally written by Charlie Raven and then reworked by Rohase Piercy. I haven’t read any of Piercy’s other fiction yet, but I know her 1988 book, My Dearest Holmes, is a queer reading of the relationship, so I thought there might be a certain sympatico. A Case of Domestic Pilfering is a delightfully fast-paced adventure seen mainly through the eyes of well-to-do Guy Clements and his dear friend Max Fareham in the summer of 1890. They are very much more than good friends, in fact, and not always as discrete as they might be. Guy is vivacious and more than a little foolish, an extroverted drama queen and aesthete, more Bosie than he is Wilde, despite his pretentions. Max is less well off, less overt, and really very sweet. 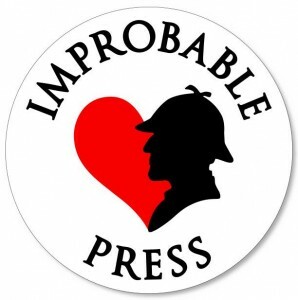 They fall into trouble through a combination of events, including the theft of some important documents, a clever and desperate young housemaid, a shortfall of funds for gambling debts, a little domestic pilfering, and a chance meeting with Dr John Watson at the races. Holmes of course is involved in an investigation and all the elements become rather tumbled as the Great Detective doesn’t quite get hold of the right end of it. Holmes and Watson are supporting characters in a story of misunderstandings, cross-purposes, disguises and secrets. It feels very much Wilde meets Wodehouse, with it’s foppish upper class young men who are mentally negligible. The book is hugely fun and reads at a smart pace. I’ll definitely be looking for more of Piercy’s work -. You can read an excerpt of A Case of Domestic Pilfering here.